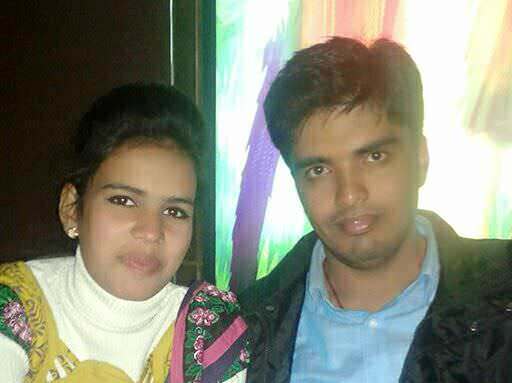 Vikram used to work on temporary projects for the Hyderabad University before and was preparing for some government jobs, when he got married last year. He was going through many struggles, but was hopeful that given his qualification he would get a good job soon. “When my wife announced that she was pregnant, I was sure I could manage expenses. I knew I would have to take a small loan for her delivery, but never in my wildest dreams did I imagine that our child would need such expensive treatment. I had to even let go of my temporary job to monitor his health full-time at the hospital. There is nobody else who can get things done,” says Vikram. 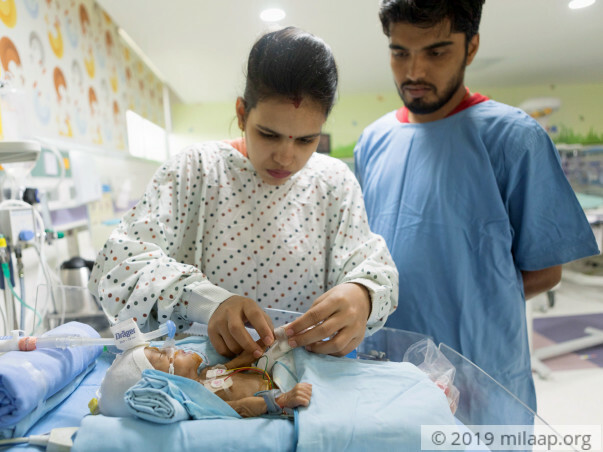 Vikram’s wife, Suman Kumari, had such a smooth pregnancy that she remembers telling her mother that she hoped to have an easy delivery. She went for scans and took medicines regularly. 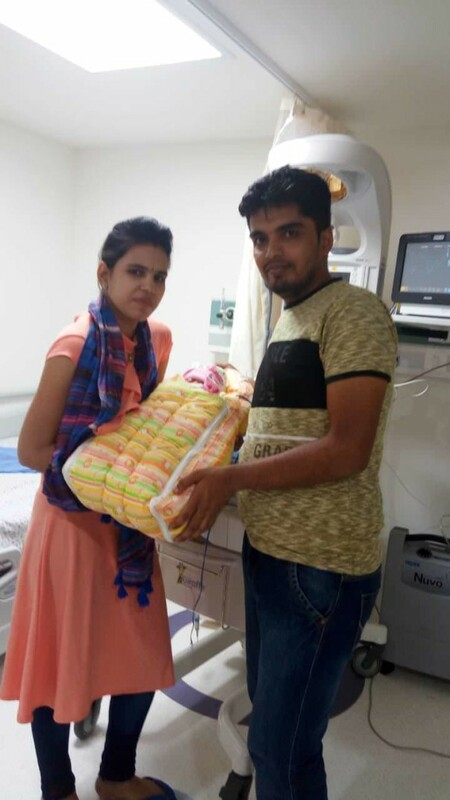 Suman and Vikram were waiting to take care of their baby in the best way possible. But at 28 weeks her water broke unexpectedly and she had to wait for hours before doctors finally decided to deliver her baby. And now, Suman is scared to even touch her baby because she thinks he can get infections fast. She does not want to endanger her baby’s life at any cost, even if it means to stop going near him or holding him too much. 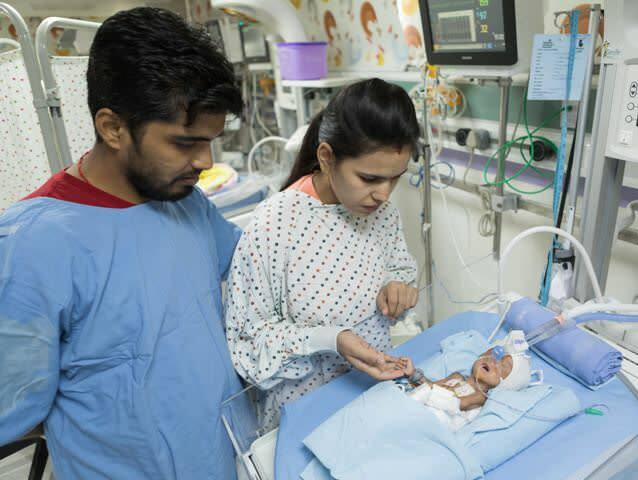 The couple’s baby boy had many birth complications, ranging from low birth weight to breathing difficulties and infections. He has even undergone one major surgery. 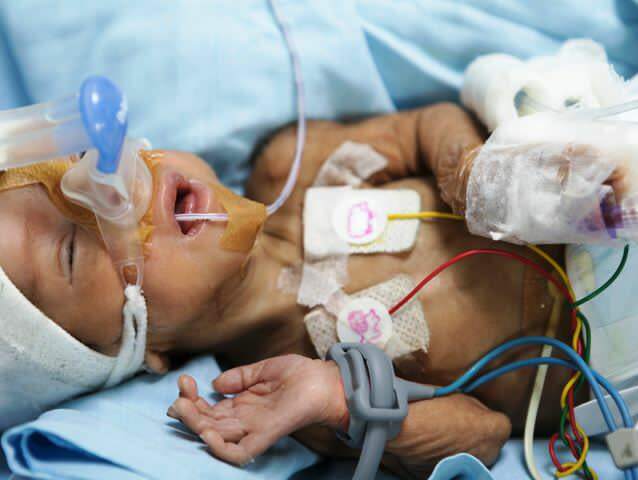 The doctors have clearly told Vikram and Suman that without prolonged stay in the NICU, their baby will not survive. 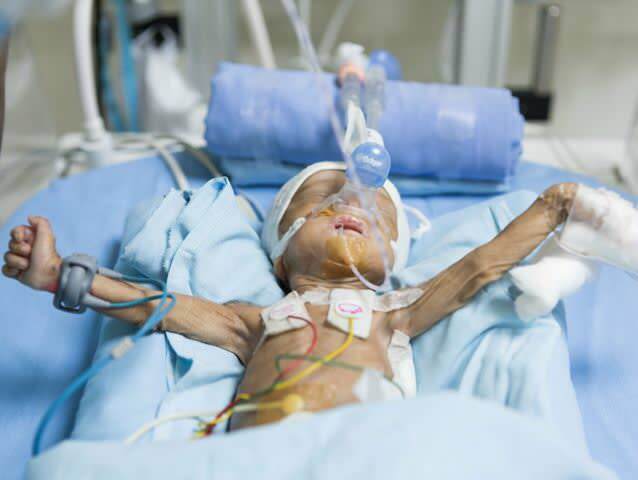 “When I see his tiny body encased in tubes and medical equipment, I am filled with guilt. If only I had a high-paying job. I have taken money from friends and they are helping me for now, but I am not sure how I will pay off the expensive medical bills. Every day, he has some or the other complication. 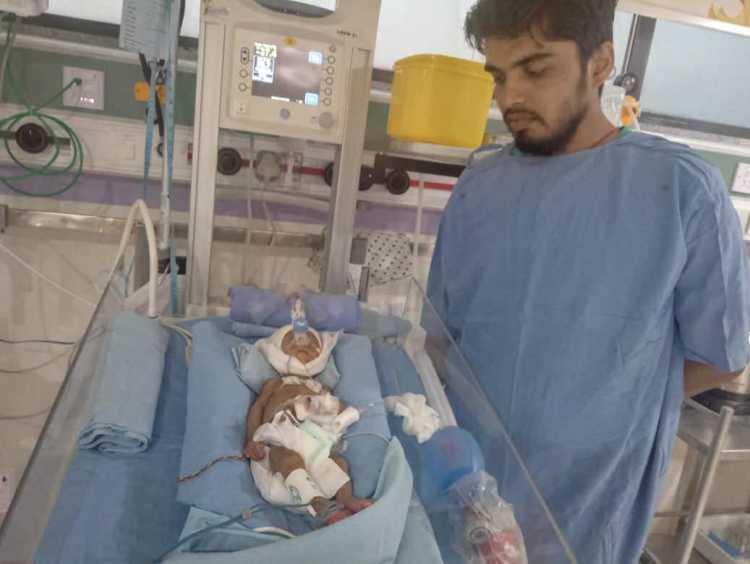 Doctors have still not been able to put him off the ventilator. Expenses are escalating and I have lost count of the number of times I have borrowed from people. I do not know if they will help me anymore,” - Vikram. Vikram’s father is a retired army personnel who is a heart patient. He has taken Rs 4 lakhs as loan from his pension fund to help Vikram with expenses. The elderly gentleman has not even met his grandchild, but has given away his life’s worth for him. 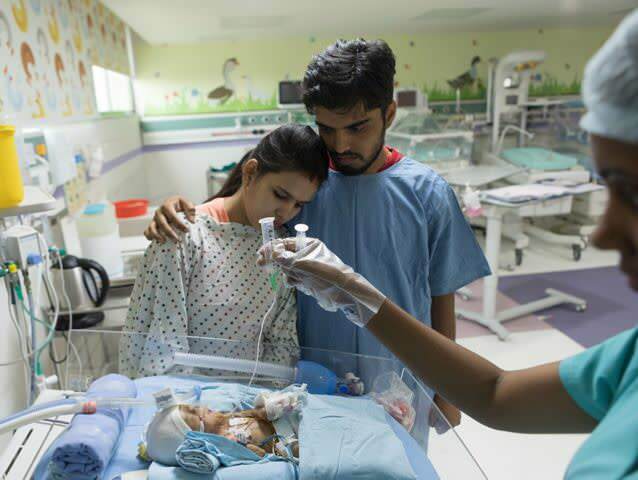 Vikram cannot afford Rs 18 lakhs that is required to fund his baby’s medical expenses. 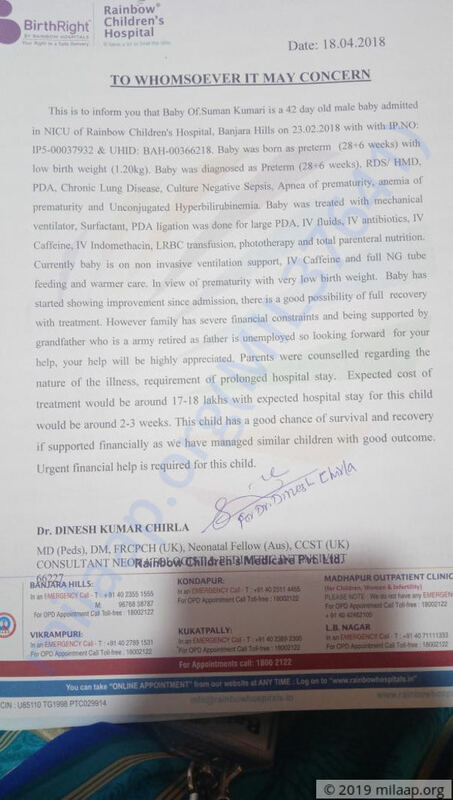 The baby boy is fighting hard but needs more comprehensive treatment and time to be fit for this world. Baby boy of Suman is currently at home and he's doing well. The oxygen support and nebulization is no longer needed for him. We have have been visiting the doctors for regular follow-ups and so far there has been no complication and he's recovering well. Thank you so much for the love and support which you have shown towards us, this couldn't have been possible without the support of you all. The baby will be discharged today. However, he will be undergoing medical management at home. 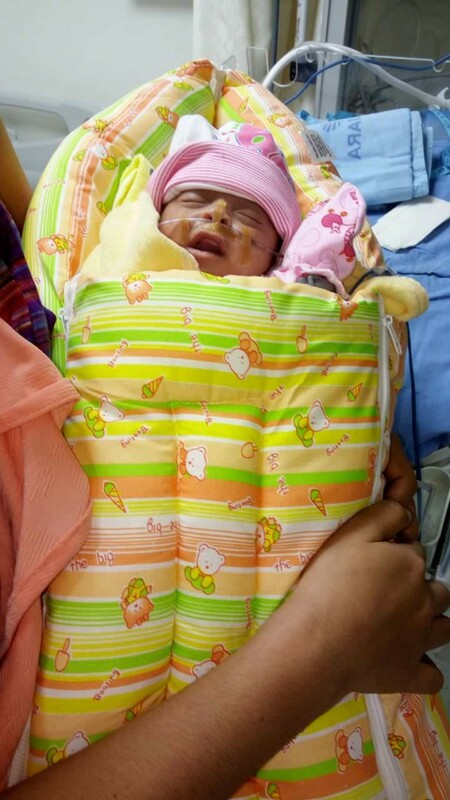 Doctors have stopped the medicines but the baby still needs nebulization and oxygen support. There is considerable increase in the weight which is again a good sign of progress. Thank you so much for the love and support. Will keep you posted as his health progresses. The baby is currently at the hospital and is doing fine. He is now on the low oxygen support and showing signs of improvement. Doctors have prescribed nebulization four times in a day for the better functioning of the baby's lungs. There is also an increase in weight by 300 grams which is also a good sign of progress. The baby will be kept under observation for some time till we are sure that he is good to go home. We are grateful to all of you for the wonderful support.